Greetings from the Union Rescue Mission! This is a picture of the November 2011 graduating class from the Christian Life Discipleship Program, of which I am a part. 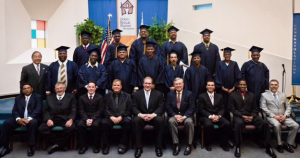 These men have completed a one-year program that includes Bible studies, church attendance, twelve-step class attendance, general education classes, one on one counseling, and work assignments at the mission. I have the privilege of teaching the first four steps of the twelve-step program. In the four step program, we put a heavy emphasis on coming to trust Christ. I also teach two Bible studies each week, currently in Ephesians. It is so wonderful to see these men come off the street, where many of them have lived for years, and turn their lives to Christ. For many of them, this graduation is the first thing that they have accomplished in their lives. I wish I could show you a picture of the families in the audience; to see the joy on the faces of the mothers, fathers, children, wives, and others seeing their loved ones completing this program is overwhelming. This is a small class. We usually have about thirty graduates, but even thirty is a small success rate out of 120 men usually in the program. Many who begin the program never finish, and some who finish revert back to their old habits, but there are some who God has changed into new people. These men are walking with the Lord and are making new lives for themselves. For a lot of these men, leading a productive life is fraught with problems, but they are trusting God. We need to keep them in prayer. I have been given a new task along with my other responsibilities, and that is to rewrite the entire twelve-step program, to make it even more Biblically based and theologically sound. So, please pray for me, as this is a daunting task.